Bound by an uneasy alliance, this 16-year-old, boomerang-slinging punk and her companion omnidimensional horror are one of the Rogue's best brawler teams. Formidable on their own but fearsome together, Shayne and Aurox fight for nobody but themselves, and like it that way. Cloaks Shayne. When the cloak expires or is cancelled, Aurox crashes down, dealing damage to the area surrounding Shayne. Aurox charges forward and pulls the first enemy he encounters back to Shayne, dealing damage. Summons Aurox at target location, dealing damage over several seconds. After ending, nearby enemies are knocked into the air. When Aurox is disabled, Shayne moves faster. Shayne’s companion djinn serves as Shayne’s shield and bodyguard, helping to melee enemies at close range. Shayne’s secondary attack hurls her trusty Boomerang that damages enemies on impact. 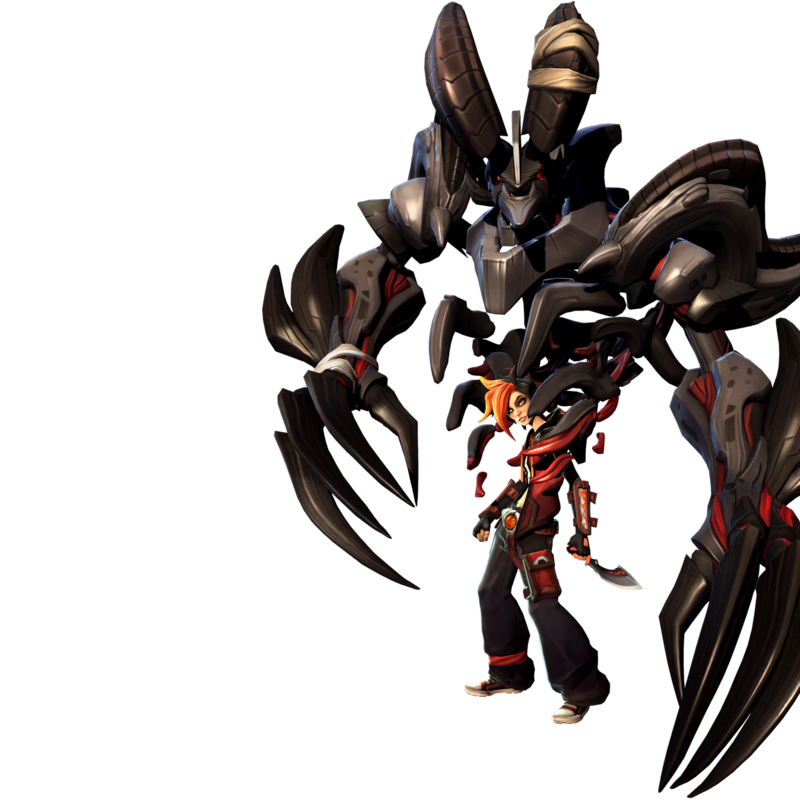 While Shayne is cloaked by Stealth Strike, she projects an area of effect that damages nearby enemies. Enemies damaged by Aurox at the end of Stealth Strike are slowed for a brief time. Shayne’s Boomerang bounces to a nearby enemy on a successful hit. Fetch steals some of the target’s shield on impact. At the conclusion of any skill, Shayne and Aurox’s shield immediately begins to recharge. Shayne takes reduced damage while cloaked by Stealth Strike. Shayne’s health regenerates while her shield is broken. While Tag Team is active, Aurox steals shield energy from nearby enemies, returning it to Shayne. Shayne gains an overshield after successfully hitting an enemy with Fetch. Shayne and Aurox’s first attack after the conclusion of Stealth Strike deals additional damage. Increases the rate of shield recharge. Instead of pulling targets, Fetch now stuns enemies on impact. Fetch damage penetrates enemy shields. Increases damage dealt by Stealth Strike’s final impact. When Tag Team is activated, Aurox draws in nearby enemies, slowing them at close range.